Beat everything together in a bowl for three minutes with a hand mixer. Pour into a greased bundt pan, bake at 350 for one hour. What an easy and yummy cake!Kisses! WOW! 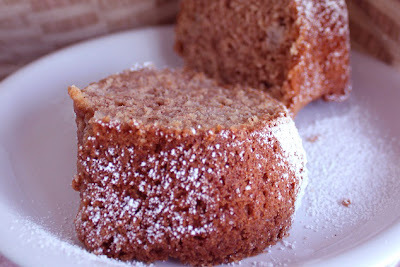 Your pound cakes looks fluffy and soft :) I like it with lot of pecan nuts!! Butter pecan-yum! Guess I need to wake up in the baking aisle-I have never seen cake mix of that flavor. Your list of ingredients tell me that this is a really moist cake. Love the addition of the butterscotch flavor in there. Great post-have a good day Claudia! Mmmmmm, sour cream and butterscotch pudding mix. I love semi-homemade recipes. They make life so much easier and with great tasting results. I've never tried this before but definitely will. Thanks for sharing. Buttery and light in texture. Oh yum! I love the butter pecan flavor. I remember ice cream with that flavor - my favorite! Pound cakes are so good but I bet a butter pecan flavor is terrific. I recently read that pecans will be getting very expensive due to weather issues in the growing areas. Look out! Those holiday pecan pies are going to be the price of gold. You had me at butterscotch and pecan, but look at that moist cake! To die for :) What do all you bakers do with whole cakes and pies though? Who eats it all? What wonderful flavors to incorporate into pound cake! Scrumptious. I love butter pecan anything! I love how you spiced up the cake mix! Wow Claudia this looks so light and airy. Great job on this one. Looks super tasty. Butter pecan was my mom's favorite ice cream - I wish I could make this pound cake for her, she would have loved it!